The Northwest Asian Weekly Foundation is proud to honor women who have made significant impact and contributions to our community. Here is a selection of our “Rising Stars” who will be honored Friday, May 15, 11:30 a.m.-1:30 p.m. at the China Harbor Restaurant in Seattle. Zenzile Brooks, PhD, is the Marketing Manager for Glosten, a Seattle-based engineering consultancy focused on naval architecture, marine engineering, ocean engineering, and detailed design. Dr. Brooks earned her undergraduate degree in Civil Engineering from the University of Southern California, and obtained both a Master’s and PhD in Civil Engineering from the Massachusetts Institute of Technology. Her role as Marketing Manager combines her passions for storytelling, engineering, and building relationships. She is an active member of the Society of Naval Architects and Marine Engineers (SNAME), and serves on the Education Committee of the Seattle Chapter of the Society of Marketing Professional Services (SMPS). A native of Oakland, California, Dr. Brooks spends her free time in Seattle cooking, exploring, and training for the upcoming RAGNAR Northwest Passage relay race. Kia C. Franklin is an education advocate with a passion for equity and social justice. This calling was shaped at an early age, when as a student in the Seattle Public Schools she observed troubling disparities in the quality of education and support given to students, falling along racial and socioeconomic lines. She has worked in various youth-serving and education-focused non-profit organizations in the Seattle area, including TAF (formerly Technology Access Foundation) and the Urban League of Metropolitan Seattle, where she now serves as a board member. She currently works as a Partnership Director for Equal Opportunity Schools, where she provides consulting and coaching services to school districts and high school administrators who are committed to increasing access to rigorous courses for underrepresented students. Kia is a proud Seattle native and a graduate of Stanford University (B.A.) and Georgetown University (J.D.). Marisa Herrera, PhD, is the Executive Director of Community Building & Inclusion at the Kelly Ethnic Cultural Center at the University of Washington in Seattle. She received her Doctorate in Higher Education Administration from the University of Southern California. Prior to coming to the UW, Marisa was the Assistant Director of Undergraduate Admission and the Associate Director of El Centro Chicano at Stanford University and worked in student affairs positions at UCLA and Northern Arizona University . In 2010, she circumnavigated the globe and served as the Assistant Dean of Students on Semester at Sea, where she worked alongside Archbishop Desmond Tutu and traveled to 15 countries and five continents. In 2014, she started the Leadership Without Borders Room at the UW as part of her National Hispana Leadership Institute community project, the first center in the state to offer leadership development, advocacy and community building for undocumented students. Rita Meher is founder of TASVEER. After 9/11 Rita made a short film on racial bias in the United States, but could not find a platform to share her experience and thoughts which she had captured in her film. She formed TASVEER (which means “the picture or reflection”), an organization dedicated to showcase the talents of independent filmmakers from South Asia while giving them a platform to discuss many thought-provoking issues (often ignored by the mainstream cinema like Bollywood films) with their audience. TASVEER held its first Seattle South Asian Independent Film Festival in 2004 exploring various social issues. The festival has become one of the largest independent film festivals in the entire Northwest. TASVEER has also been hosting “Aaina” (“the mirror”) for the last nine years, its annual signature festival focused on South Asian Women. Katie Wilson co-founded the Transit Riders Union in 2011, and has served as its elected General Secretary since 2012. In that time TRU has fought successfully to preserve the Metro bus service and was instrumental in winning a reduced fare for low income riders. Katie has lived in Seattle since 2004 and has worked many low wage jobs, from coffee-making to apartment managing to construction. In addition to fighting for better and more affordable public transit, she is currently co-founding a worker cooperative landscaping company called Black Cap Cooperative Landscaping. Diana Lindner was born in Buenos Aires, Argentina and received her MD from the University of Buenos Aires. She moved to the US in order to obtain postgraduate training in Pediatrics, and had a pediatric residency and fellowship in Pediatric Endocrinology at UW/Childrens Hospital. She worked with Eastside Pathways, preparing children for success in life from prenatal to career. She is currently part of the subgroup early learning/ school readiness. She manages the Reach Out and Read project also related to kindergarten readiness. She is active with Mujeres of the NW and the Eastside Latino Leadership Forum. C. June Strickland is a citizen of the Cherokee nation, from the family of Hawkins. Since 1994 she has been a faculty member in the University of Washington School of Nursing. She received a MS in health education and Ph.D. in Higher Education, Policy, and Governance from the University of Washington. Her research focus is in prevention science, translational/ transcultural research, with American Indians in the Pacific Northwest. She is affiliated with the Intercultural Cancer Council (ICC), as a Board member, and the Spirit of Eagles National Community Projects Network, funded by the National Cancer Institute, and has focused on women’s health screening in most of her research with Pacific Northwest tribes. M. Lorena González, a nationally recognized attorney, civil rights leader, has recently served as a senior advisor and legal counsel to Seattle Mayor Ed Murray. Before working for the Murray Administration, Lorena represented women, older workers, low-wage workers and people of color in employment, wage theft, and gender discrimination cases. In the past year, she has helped set policy and implement historic minimum wage and worker protections alongside the Mayor, unions and progressive leaders throughout Seattle. She is the President Emeritus of OneAmerica, the State’s largest immigrant and civil rights organization, based in Seattle and served on the Seattle Police Accountability Review Panel in 2007. Committed to transparency, Lorena served on the Seattle Ethics and Elections Commission. Tracy M. Hilliard, Ph D, MPH, is the Director of Data Integrity for the City of Seattle’s Human Services Department. She leads strategy and innovation around the use of data to improve social services. She is also a Clinical Assistant Professor in the University of Washington (UW), School of Nursing, Department of Psychosocial & Community Health. Dr. Hilliard earned a PhD in health services, a MPH in maternal and child health, and a BA with Distinction in sociology, all from UW. She is Chair of the Health Informatics and Information Technology Section of the American Public Health Association. Andrea Akita is the Executive Director of InterIm Community Development Association (InterIm CDA), a nonprofit community development corporation in Seattle that works to promote resiliency among Asian American, Pacific Islander, immigrant and refugee communities. For 45 years, InterIm CDA has developed affordable and mixed-use development housing projects, led neighborhood planning initiatives, and promoted community building activities. Prior to joining InterIm CDA, Andrea was a manager in the Seattle Human Services Department, where she planned and developed housing stability and supportive services programs to reduce and end homelessness. She has more than 20 years of experience working with nonprofit organizations and public agencies. She has served as the Housing Services Manager for the Northwest AIDS Foundation and as a program officer for the Washington Community Development Loan Fund. Thanh Tan is a multimedia editorial writer. Prior to joining the editorial board of The Seattle Times, she was a political and general assignment reporter with local TV stations in Boise and Portland, an Emmy-winning reporter, producer, and host with Idaho Public Television, and a multimedia reporter / producer with The Texas Tribune in Austin. She has also contributed to “This American Life” and The New York Times. Born and raised in Olympia, Thanh graduated with honors from the University of Southern California. She loves food, music, politics, films, yoga, the outdoors and journalism. She lives in South Seattle. Lani Cao graduated from the China University of Politics and Law. Following graduation, she served as in-house counsel for a major fuel company in Beijing, China for seven years. During her time in Beijing, she co-authored published books on key topics in Chinese corporate law. Seventeen years after obtaining her first law degree, Cao attended law school in the United States and obtained her Juris Doctorate degree. Since then, Lani Cao has been practicing law in Seattle, Washington. She focuses on immigration law, and her broad-reaching background and experience in family law, business law, and estate planning helps her better serve her immigration clients in a more thorough and thoughtful way. Cao is an active member of the Chinese community in the greater Seattle area of Washington State. She served on a volunteer basis as the Principal of the Northwest Chinese School from 2007 to 2009. 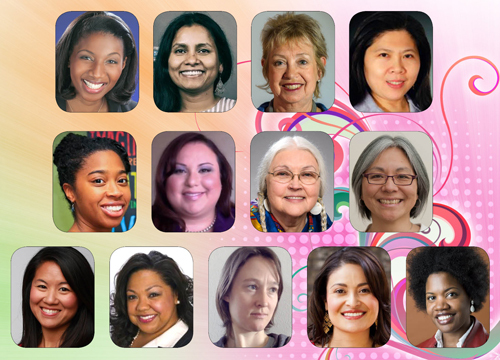 Email rsvp@nwasianweekly.com to attend the luncheon honoring the Rising Stars.Ticket prices are $45. Student prices are $25 with I.D.